Thus ends the turbulent non-month that is November. A great many things have happened this month, most of them perpetrated by fools. Be it the mustachioed madness of Movember, where hordes of hapless men grow their itchy face hair because suddenly prostate cancer is cool. Or alternatively the insanely optimistic troops of NaNoWriMo and their slog to an arbitrarily defined target. I was one of these fools. I chose NaNoWriMo because it provided a challenge, it was productive, artsy, enriching and also because I can’t really grow a moustache. (I “won” in the end. I was very happy.) But despite all the hectic dashing about and the hurly-burly of this, that and the other, Pictonauts was still rumbling away in the background. Not the rumble of a mighty volcano fit to shower the surrounding locales with hot, steamy lava. More the rumbling of an empty tummy, or slightly cross cat.This month we had The Sphere, a strange and curious thing. 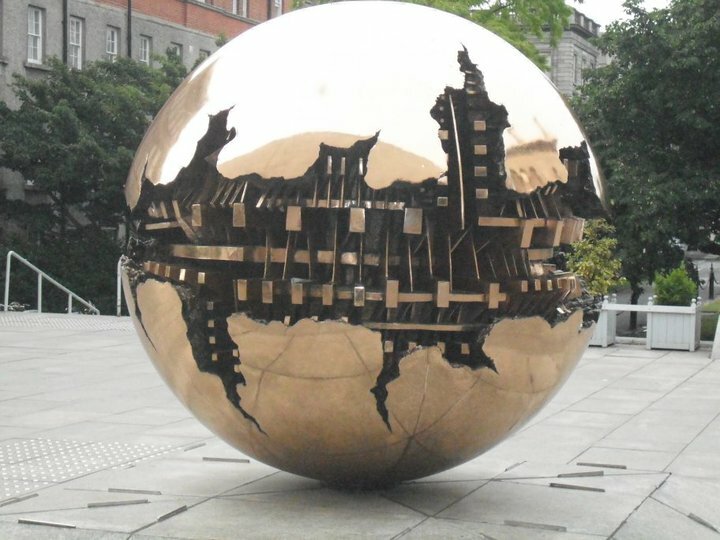 The eponymous sphere is in actuality a sculpture called “sphere within a sphere” by the Italian artist Arnaldo Pomodoro, there’s quite a few of them scattered across the world, but this particular one is located in Trinity College, Dublin. I saw it when I was on holiday there last year. Dublin’s a very nice place, you should all visit it. I’m not entirely happy with my wordascope this month. Although my original intention had been to slot it into that whole NaNoWriMo lark that plan fell by the wayside. It was slated as the topic of chapter 17, I only got to chapter 10. So I knocked something together over the last few days instead. It’s a bit rushed, the narrative is vague and nothing really happens. I don’t like it. But it’s better than nothing I suppose. Once again the same stalwart Pictonauts have returned with their take on the picture. Behold and gaze in the wonderments at that which they did wrought! (Except me, mine’s crap). I am quite intrigued that two of the wordascopes feature time-travel in one aspect or another. Andrew Blair – Trans-temporal sport based shenanigans. Remember to check out #pictonautchallenge for updates, information, links and such like. And don’t forget to pop back tomorrow for Pictonauts December. This entry was posted on Wednesday, November 30th, 2011 at 12:15 pm	and tagged with NaNoWriMo, Pictonauts, Short stories, The Sphere, wordascope, Writing and posted in Pictonauts, Writing. You can follow any responses to this entry through the RSS 2.0 feed.